In a pot of boiling water and cook until just undercooked. Cut the courgette into strips. Put oil in pan and put on a medium heat, Cook the courgettes for 6 mins each side until softened. You may need to do this is 2 separate batches. Beat the eggs, pesto, garlic and cream cheese together. 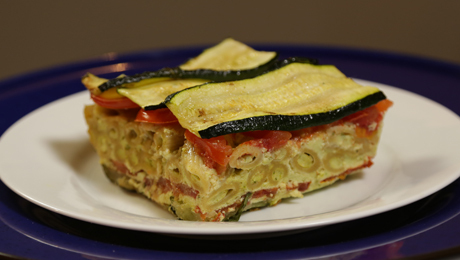 Arrange the sliced courgette and tomatoes lengthways with the pasta mixture in between. Bake in the oven for 55 - 60 minutes until set.